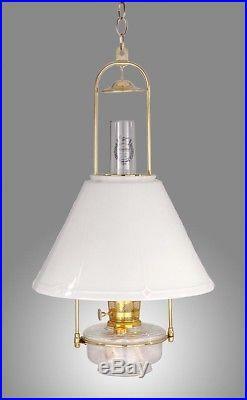 BH715-716, Deluxe Glass Hanging Lamp with a solid brass tilt frame, Model 23 (N236AB) solid brass mantle-type burner that provides bright-white illumination from kerosene lamp oil, a genuine AladdinÂ® brand heel-less chimney, and a well-made 14" diameter opal glass slant shade, 28" lenght from top loop to bottom of font, comes with approx, 3 foot of brass plated chain for adjustable drop, This is an all-original, complete Aladdin brand lamp. BH715-716, Deluxe Glass Hanging Lamp. Deluxe Glass Hanging Lamp with a solid brass tilt frame. Antique Lamp Supply - Our Guarantee to You We guarantee every item as to quality and construction. Adjustments to your satisfaction will be made on any item found to be defective. The item "Aladdin Item No. BH715-716, Deluxe Glass Hanging Lamp" is in sale since Saturday, August 25, 2018. This item is in the category "Collectibles\Lamps, Lighting\Lamps\ Non-Electric\Kerosene". The seller is "antiquelampsupply" and is located in McMinnville, Tennessee. This item can be shipped to United States.